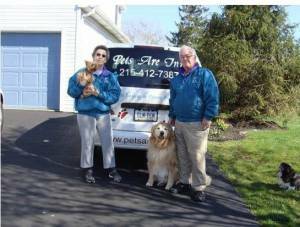 Moving into the Montgomery County area in 1993 after George retired from the Philadelphia fire department and Pat retired from being an apartment manager, we heard about Pets Are Inn on a local radio station and joined the team in 1995. We have owned dogs, cat, rabbit, guinea pigs and birds. With 20+ years of experience, we have learned so much about all the different pets. We understand the unique needs and requirements of each individual pet. We conduct an interview with clients to learn all about your pet. Then we match your pet with the perfect Host Family. Our Host Families make the business a success. They are the biggest pet lovers you have ever seen. Your pet is pampered and loved just like at home. Pets go home happy and tired after their vacation. The owners can tell that they were treated well. We have been providing quality pet boarding for over 20 years. We have watched so many puppies grow into adults and go over the rainbow bridge. We only have them for a short while so enjoy them while they are with us. We currently have a Westie a French Bull Dog and a Golden retriever and two birds.